I know we shouldn’t play favorites, but THIS is my all time favorite holiday food tradition… and being from a large Italian family, there are lots of traditions! A quick note on gluten-free baking… Holiday baking has always been a huge tradition in our family. So when my son was diagnosed with celiac disease 8 1/2 years ago, I panicked because I didn’t want him missing out. I soon discovered GF Jules All Purpose Flour (Affiliate link) which allowed us to make all of our favorites Gluten-Free and no one knew a difference! Like I said, Cranberry Bread is the one I look forward to most so it was important to me that it tastes great gluten-free. This family recipe works so well with gluten-free flour, I really can’t taste the difference. 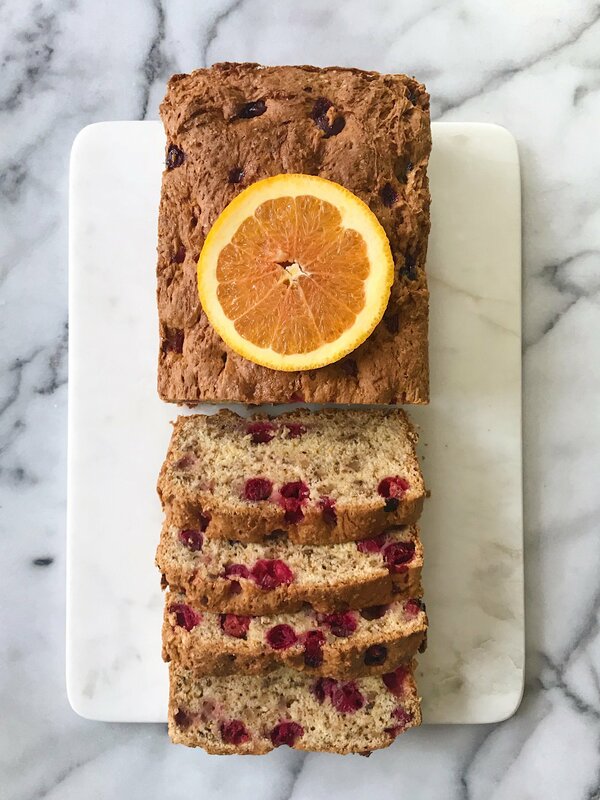 This Cranberry-Orange Quick Bread is a family favorite! 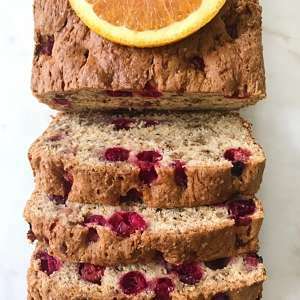 It's moist, not too sweet or tart, has a slight orange flavor and is just SO YUMMY! It's a long time family recipe that adapts beautifully to gluten-free flour. Makes 1 10" loaf pan or 4 mini loaf pans. Prepare 1 10 inch loaf pan or 4 mini loaf pans by greasing them and lightly dusting with flour. Place all the dry ingredients in a large mixing bowl and mix with a pastry cutter. Cut in butter using the pastry cutter until the mixture resembles a coarse cornmeal. Separately combine the orange juice, orange rind and the beaten egg in small bowl or large liquid measuring cup. Pour liquid mixture all at once into the dry ingredients and mix just enough to dampen. Carefully fold in the nuts and cranberries. Spoon into prepared 10" loaf pan or evenly into 4 mini loaf pans. Spread the corners and sides slightly higher. Bake at 350°F for one hour. A butter knife (or wooden skewer or cake tester) should come out of the center cleanly.